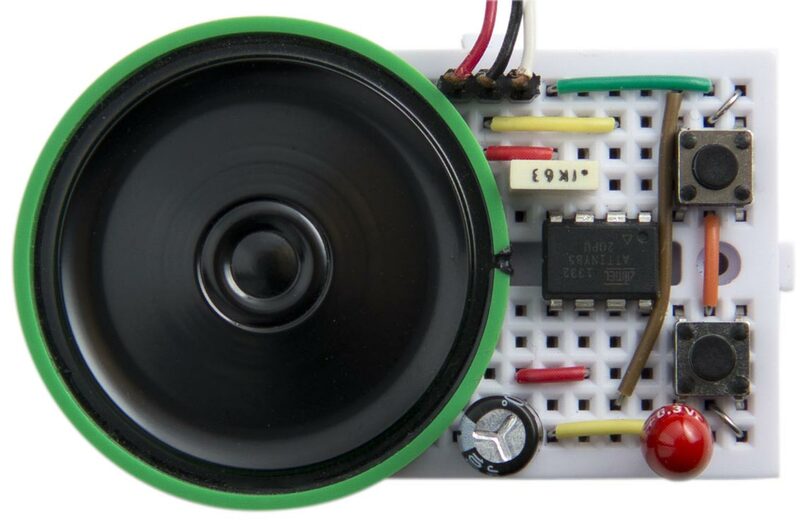 Audio Pitch Shifter, based on an ATtiny85, allows you to increase or decrease the pitch of an audio input. For example, you can plug in an mp3 music player or phone, play some music, and change the pitch of a male singer's voice to a female voice as it's playing. Although the result is not hi-fi quality, it's an excellent demonstration of how much you can achieve with a single ATtiny85. The chip first amplifies the input by a factor of x20, digitizes it, stores the samples in a circular buffer under interrupt, reads samples back from the circular buffer under a separate timer interrupt, and finally converts the processed digital signal back to analogue, using high-speed PWM, and outputs it to a loudspeaker. Two push buttons cause interrupts which change the pitch shift up or down. The Audio Pitch Shifter circuit, based on an ATtiny85. How the Audio Pitch Shifter buffer works. In this application the buffer is 256 bytes long, which fits within the memory of the ATtiny85. This makes it easy to implement a circular buffer; we simply truncate WritePtr to a byte after incrementing it. Because we are sampling at approximately 18kHz the buffer represents about 140msec of audio. The next step is to read samples from the buffer using a second pointer, ReadPtr. If these samples were read at the same rate as the WritePtr samples the two audio streams would be identical. However, by increasing the ReadPtr sample rate we can shift the pitch up, and by decreasing it we can shift the pitch down. For example, reading at a 36kHz sample rate will shift the audio up an octave. The pitch shift happens in real time, without affecting the tempo of the music, so it's quite different from simply speeding up or slowing down playback of a sample. 7<<MUX0 Differential inputs ADC2 (PB4) and ADC3 (PB3) with a gain of x20. 1<<ADIE Enable the ADC conversion interrupt. 5<<ADPS0 Select a prescaler of divide by 32, giving an ADC clock of 250kHz. 1<<BIN Bipolar input mode (BIN = 7). For more information about these settings look at the ATtiny85 datasheet. Since the ADC conversion takes 14 clock cycles the sample rate will be approximately 250/14 or 17.9kHz. When each conversion is complete an ADC interrupt occurs. This reads the ADC value and writes it into the array Buffer. Because we're using bipolar input mode the ADC reading is a signed 8-bit value, in the range -128 to 127, so we add 128 to make it an unsigned 8-bit value. The array pointer WritePtr is then incremented, and truncated to 8 bits to make it wrap around, giving a circular buffer of 256 bytes. Since we are only interested in 8-bit accuracy the ADC is configured with ADLAR=1 to left-adjust the data, so we can read the top 8 bits from the ADCH register and ignore the ADCL register. The frequency of the PWM square wave is specified by OCR1C; we leave it at its default value, 255, which divides the 8MHz clock by 256, giving 250kHz. The values we want to output are written to OCR1A, which varies the duty cycle. If OCR1A is 0 the PWM waveform is almost always off, giving an analogue output of almost zero. If OCR1A is 255 the PWM waveform is always on, giving an analogue output of VCC. The rate of this interrupt is the 8MHz system clock divided by a prescaler of 8, and an initial value in OCR0A of 55+1, giving 17.9kHz. This is the same as the ADC sample rate, so initially the audio will play at normal speed. As in the ADC interrupt service routine, the ReadPtr is incremented and truncated to make it wrap around when it reaches the end of the buffer. The pin-change interrupt service routine simply reads which button was pressed, and then increments or decrements OCR0A to change the output sample rate, and hence the pitch of the audio. Each time you press a button the value of OCR0A increases or decreases by 1. It's not much more complicated but gives a noticeable improvement in sound quality. This Audio Pitch Shifter could be used as a voice-changer, or as a special effect in a synthesiser or audio processor. Connecting the Audio Pitch Shifter to an audio amplifier. I compiled the program using Spence Konde's ATTiny Core, which supersedes the various earlier ATtiny cores . Select the ATtiny x5 series option under the ATtiny Universal heading on the Boards menu. Then choose Timer 1 Clock: CPU, B.O.D. Disabled, ATtiny85, 8 MHz (internal) from the subsequent menus. Choose Burn Bootloader to set the fuses appropriately. Then upload the program using ISP (in-system programming); I used Sparkfun's Tiny AVR Programmer Board; see ATtiny-Based Beginner's Kit. Here's the whole Audio Pitch Shifter program: Audio Pitch Shifter Program. 12th February 2017: Made an adjustment to the initial output rate after making measurements with a signal generator.